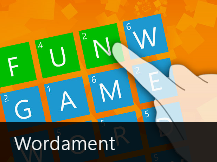 Wordament is a free word game where you can download from Windows Store for your Windows 8 computer. Wordament game is one of the best Windows 8 game apps build by Microsoft Studios. Wordament game can also be classified as a puzzle game where you try to find hidden words as much as you can on a 4x4 grid letters board. Of course Wordament is an educational game for kids trying to enrich their word knowledge. If you have installed previous beta versions of Windows 8, probably you have played Word Hunt Windows 8 game app build for developer preview. 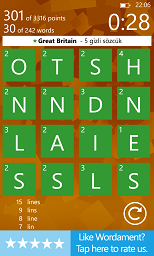 Wordament Windows 8 game can be considered as an improved version of Word Hunt game with multiple player options for final version of Windows 8 by Microsoft. The current version I'm playing is Wordament English Edition. So I try to figure out hidden English words on the game board. If there are other language editions of Wordament puzzle game, you can try to play this educational game in other languages too. Players can logon to Microsoft XBox account using their Microsoft Passport accounts which enable Wordament game to store user statistics and compare with other players results. 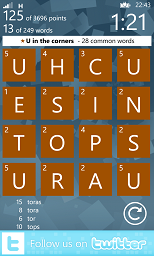 On start screen of the Wordament word game, you can see your accumulated statistical values like total score, total number of words, best game score, best word count, and best game ranking, etc. Wordament is a touch enabled game. You can play Wordament game using touch gestures on your Windows 8 tablet PC, or using your mouse pointer on your Windows 8 desktop or laptop PC. To start game, click your mouse and while pressed move the mouse pointer from letter P-L-A-Y direction. Or just swipe PLAY on a touchscreen. During the game, Wordament players have 2 minutes limited time for the live round. Although you play alone, there may be hundreds of players world-wide connected to the same game session and playing the same Wordament puzzle board with you at the same time. At the end of the game you can compare your results with others. On the left side of the game display, the letter grid and the timer are shown. Your timer will start from 2 minutes when the new round begins. You can also see the total points hidden on the board and number of total words that are waiting to be discovered during the play. On the right side, the letters you have found are displayed. At the end of the game, the set of words you have found and a small set of words that are not found are displayed. So you can see the words you missed on the puzzle board. This is a good chance to increase your word knowledge and next time you may use these words to for higher scores and ranks. Another statistics will be showing your rank among the other players played the same word puzzle with you at the same time. You can add these names as your frenemies. If you play Wordament game as a group of friends you can make a group by adding your names as your frenemies and compare your results in that group. 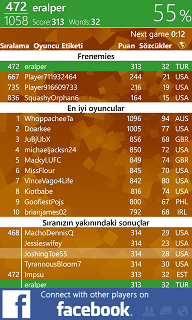 It is also possible to choose Wordament players by highlighting from the rank list displayed at the end of each round. So you can compare your performance with similar strength Wordament game players from different countries. Frenemies are Wordament players, your XBox Friends and your friends you want to pay extra attentions to game results or rankings in game leaderboards. Using Frenemies enables friends to compete each other in a group on Wordament game. If you are not a top player, I believe you will be astonished with the results you will see on the top ranks. The number of words and total points collected with these found words are displayed for the top players and for the group that have similar results with yours. While you are controlling your performance by checking your game statistics and found vs missed words, don't forget the next round is starting soon. The total time for checking found and missed words, also including checking your score and rank among other players is around 45 seconds. You can see the timer on screen informing about the time left for the next game. So be ready for the next game! If you open the Settings charm and go to game settings, you will see a list of options where you can control Wordament game. These game settings provide access to game rules, game options, puzzle language, about section, permissions granted to Wordament game, and rate and review section. After you play Wordament game for a while and get used to its controls, you will get better scores. The Wordament game just like many other Windows 8 games (like Minesweeper game) developed by Microsoft introduces Achievements for players. These Wordament achievements are granted to players who have completed some special cases and be successful in predefined acts. Here is a list of Wordament game achievements. Achieve the highest cumulative score, for the hour, of any player on the hourly leaderboard.